Poll: Should schools open on Saturdays to make up for the 'snow days'? Calls have been made to make up for lost time. 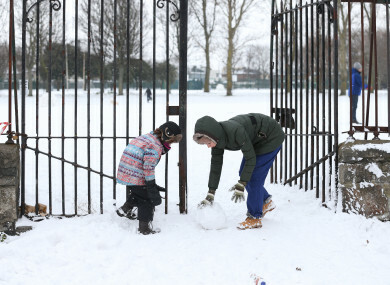 AFTER THE EXTREME weather that coated Ireland with snow for days last week, schools around the country were forced to close. Some schools closed as early as Wednesday and lost three days of classes while others were out for two days. It’s led to the director of the National Parents Council suggesting that schools be open on some forthcoming Saturdays to make up for the lost time. But what do you think, is this reasonable or an over-reaction? Poll, Should schools open on Saturdays to make up for the ‘snow days’? Email “Poll: Should schools open on Saturdays to make up for the 'snow days'?”. Feedback on “Poll: Should schools open on Saturdays to make up for the 'snow days'?”.